Just like carpets, your curtains act as air filters. They catch and hold airborne dust and odours. Test this for yourself with a simple sniff-test. Pace the curtain fabric close to your nose and smell. You will soon know if they are fresh and clean, or stale and dirty. 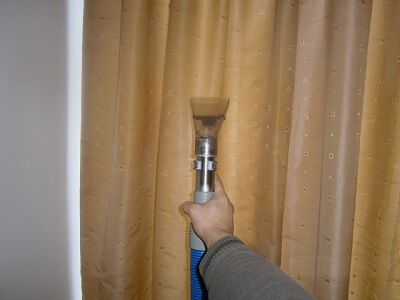 Domco cleans curtains on-site, as they hang on your walls. With our special equipment, there is no need to take your curtains down. 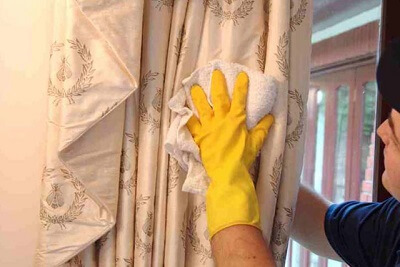 We clean all around the edges and promise that your curtains will look, smell, and feel great. Trust our Bournemouth cleaners. They know what they are doing. Why Our Bournemouth Cleaners Are the Right Choice for Your Curtains? Hot Water Extraction – a special machine is used to apply a mixture of a detergent and hot water on the curtain. This excellently loosens the accumulated dust from the fabric. And while this is happening, the nozzle simultaneously vacuums the item, extracting over 90% of moisture along with all the detached dirt. Dry Curtain Cleaning – Dry powder is applied to the item and carefully rubbed in with special brushes. This excellently loosens the accumulated dust and give the curtains a fresh scent. In the end, it is thoroughly vacuum-cleaned to remove all the dirt. The curtain cleaning can be combined with carpet cleaning or upholstery cleaning. Give your interior the special attention it needs and refresh your Dorset home. It was the first time I am using hot water extraction cleaning method for my curtains and I was worried they might shrink but this didn't happen and my curtains look and smell clean and fresh. Thank you. I would recommend you to all of my friends in Bournemouth.